To answer this question, I have to first revisit its fundamentals to make sure its fundamentals are truly intact. From it, I should be able to find clues which lead to its continuous decline in stock price. Second, I would evaluate its investment potential based on its current stock price of RM 2.25 a share. 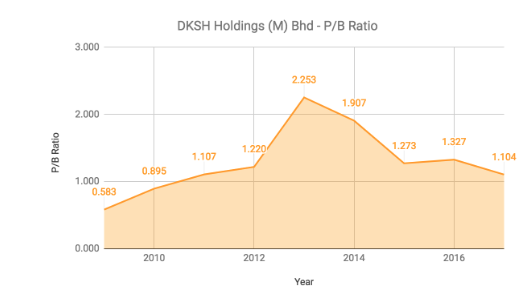 Hence, here are 10 things to know about DKSH Holdings (M) Bhd (DKSH) before you invest. 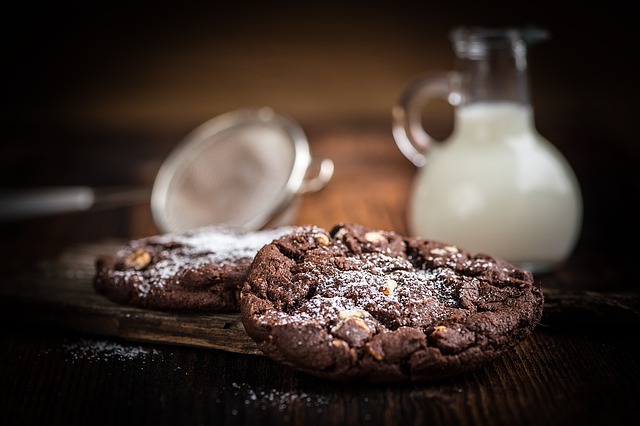 DKSH has 3 business segments: Marketing & Distribution, Logistics, and Retailing of Chocolate Chip Cookies under ‘Famous Amos’ in Malaysia. DKSH provides marketing, sales force, logistics, distributions, invoicing, credit control, and inventory handling services for local manufacturers of fast moving consumer goods (FMCG) to make their goods accessible in supermarkets, hypermarkets, kiosks, shops, and pharmacies located across Malaysia. DKSH operates from an ISO-certified 510,000 sq. ft. distribution centre at Jalan Sungai Jati, Klang. 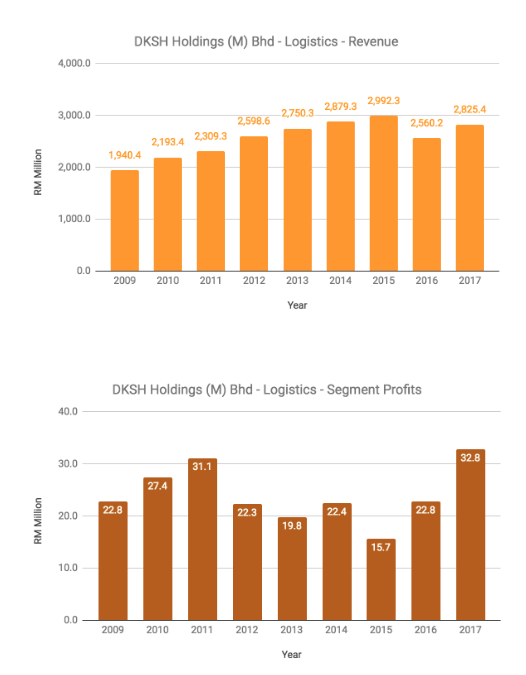 Overall, DKSH has achieved steady growth in revenue from RM 1.58 billion in 2009 to RM 2.63 billion in 2017. Out of which, segment profits grown from RM 13.9 million in 2009 to RM 61.4 million in 2013 before dropping a little to RM 50 million levels per year over the last 5 years. DKSH provides supply chain services ranging from import, forwarding, warehousing, distribution, order processing, and collections primarily for healthcare and FMCG products. From 2013 to 2015, DKSH has opened two new distribution centres in Shah Alam and Kota Kinabalu. DKSH’s distribution centre in Shah Alam measures 190,000 sq. ft. and is serving in excess of 13,000 clients that includes hospitals, clinics, dental centres, and pharmacies throughout Malaysia. Whereas, the distribution centre in Kota Kinabalu which has a size of 207,000 sq. 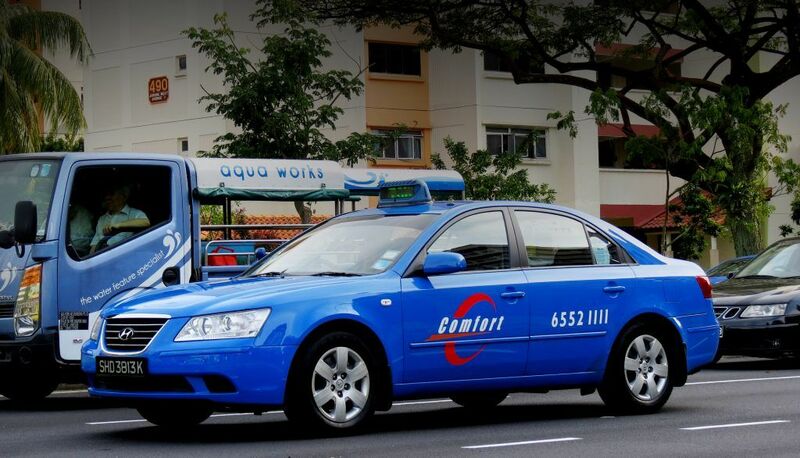 ft. is directly servicing 1,000 customers which are based in East Malaysia. Revenue has grown from RM 1.94 billion in 2009 to RM 2.83 billion in 2017. Segment profits have maintained at RM 20 – 30 million per year for the last 10 years. As at 31 December 2017, Famous Amos operates a total of 81 Famous Amos retail shops across Malaysia. Revenue has dipped a little starting in 2013. Meaningful segment profits for Famous Amos was reported in 2014 – 2017. Out of which, I found that it has not been profitable since 2015. If we compare the earnings graph with its stock price graph, we would find that stock price had mirrored its earnings over the last 10 years. In 2012, it has reported one-off gain of RM 21.1 million arising from its disposal of a non-strategic leasehold land. Excluding this gain, it would record RM 56.7 million in shareholders’ earnings in 2012. In 2013, it has reported one-off gains of RM 99.5 million from disposal of property at Jalan Universiti and its 51% interests in DKSH Transport Agencies. Excluding them, it would record RM 75.4 million in earnings. 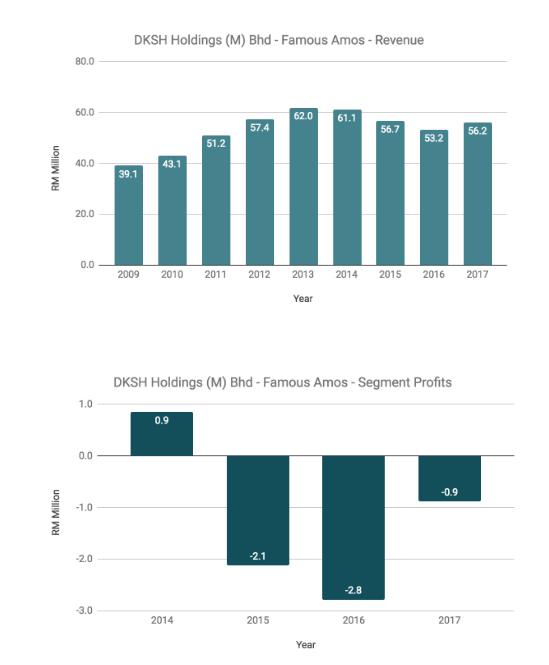 As at 30 September 2018, DKSH has reported non-current liabilities of RM 35.6 million, thus, having a gearing ratio of 6.06%. Its current ratio is 1.40. Thus, they indicate that DKSH has maintained a strong balance sheet presently. On 21 Decembre 2018, DKSH has announced its proposal to invest RM 480.9 million to acquire 100% shareholdings of Auric Pacific Group Ltd (Auric), an established distributor of chilled and frozen products. 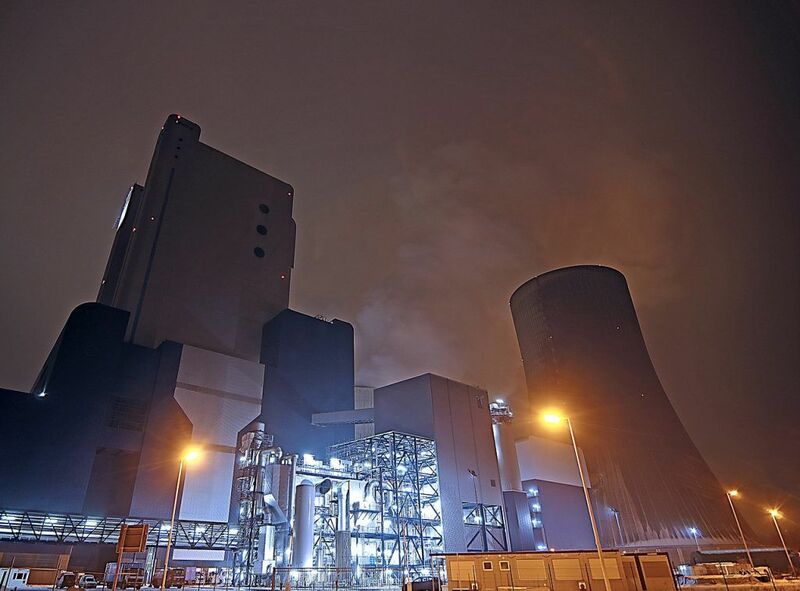 Auric was formerly listed on the SGX and was subsequently privatised by the Riady Family in 2017. The proposed acquisition is intended to increase DKSH’s clientele base, distribution network, and capitalise on cross-selling opportunities with its products and Auric’s products. The following is a summary of Auric’s financial results over the last 3 years. 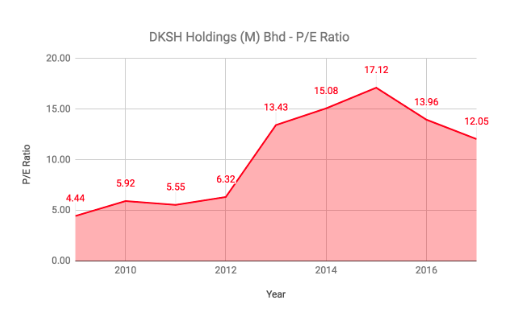 As at 10 January 2019, DKSH’s stock price is trading at RM 2.25 a share. 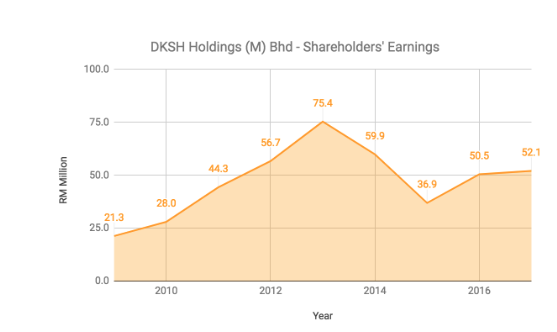 For the past 12 months, DKSH has made RM 49.7 million in earnings or RM 0.315. Hence, its P/E Ratio is 7.14, lower than its 9-Year Average of 10.43 and the lowest since 2013. 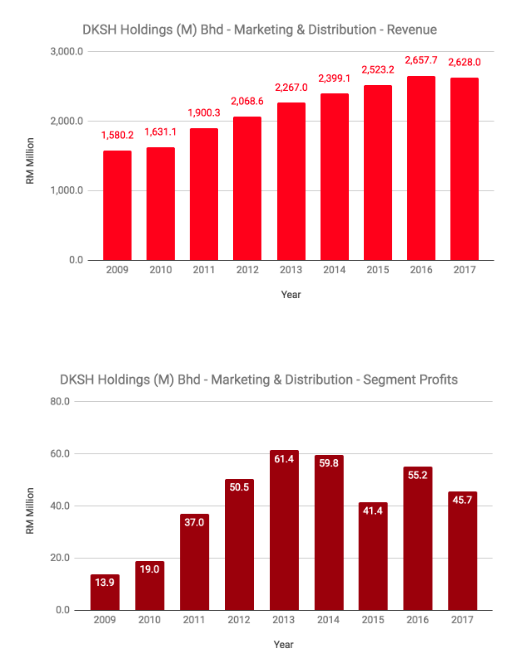 As at 30 September 2018, DKSH has net assets a share of RM 3.720. So, its current P/B Ratio is 0.60, the lowest since 2013. 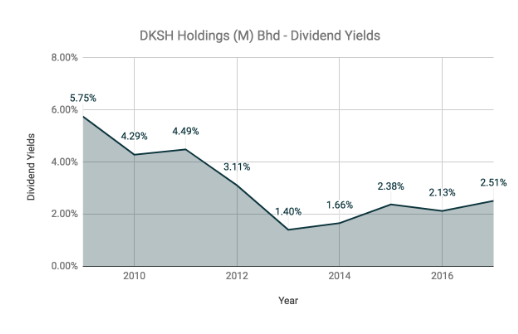 In 2017, DKSH has paid out 10 sen in dividends per share (DPS). Hence, its current dividend yield is 4.44%, the highest since 2013. Question 1: Why did DKSH’s stock price continue to fall? 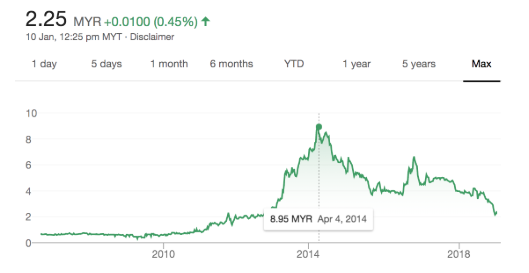 An investment in DKSH at RM 8.95 a share could have been easily avoided if we calculate its P/E Ratio, P/B Ratio, and Dividend Yield at that time. Question 2: Is this a good time to buy DKSH? 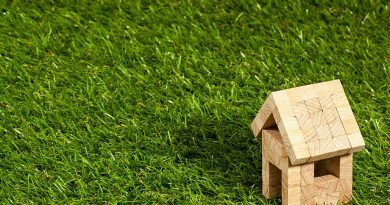 It depends whether or not you accept DKSH’s shares at current valuation. Refer to point 8, 9, and 10. I’ll leave that to you. ← Is Hong Leong Industries Bhd Attractive To Investors Now?